Isaacson could not have created a more captivating character in any work of fiction, and yet his portrayal of the larger than life Leonardo da Vinci is both thoroughly sensible and ineffably sublime. This ZIP Reads summary provides key takeaways and analysis from Isaacson’s #1 bestselling book, Leonardo da Vinci. His 600-page tomb is rich with details of da Vinci’s life from his inventions to his idiosyncracies. Let ZIP Reads help you ZIP through da Vinci and decide if it’s right for you before you spend the time and money! If genius, intrigue and inspiration can change the world, then the amazing life story of Leonardo da Vinci is truly transformative. Talented and quirky, his contribution to the realms of art, engineering and anatomy are awe-inspiring–not to mention theimpact of his most beautiful and famous creations on canvas. Where does one begin to describe such a legendary figure as Leonardo da Vinci? 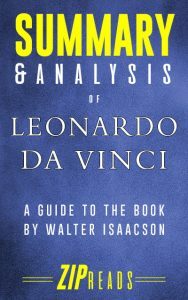 Isaacson composes the mammoth task in chronological brilliance, leading us through the twists and turns of da Vinci’s defining moments, from his birth in 1452 as the illegitimate son of a mediocre notary, to his acceptance of the irresistible invitation to the French court of Francis I, King of France in 1516. When Leonardo of Vinci, Italy was born, the world could not have imagined the extent of his talents or the vast number of valuable contributions he would make in his lifetime. Free to be himself so far as the restraints on legitimate children, Leonardo was given the tremendous opportunity to follow his own path—a rare gift in the days of ruling nobility, limiting family obligations and unyielding cultural norms. Imagine if he had been the legitimate son of Piero da Vinci and been expected to fulfill his obligations as a notary, carrying on the family occupation. The world shudders at the thought of how much poorer we might have been for it.